Weekend Inspiration: "Be Who You Are..." A Great Dr. Seuss Quote! 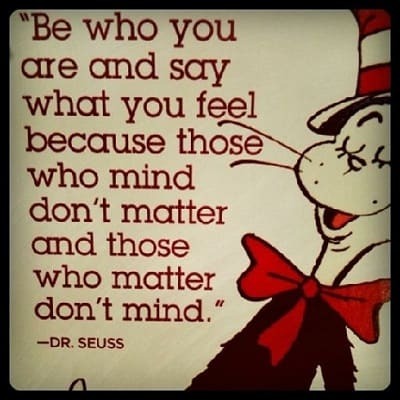 Be Who You Are and Say What You Feel… This is just one of many Dr. Seuss quotes that I love! 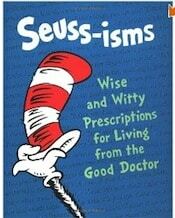 There are tons of amazingly wise and inspirational Dr. Seuss quotes in the book Seuss-isms: Wise and Witty Prescriptions for Living from the Good Doctor, and it's under $5 on Amazon right now! Image Credit :: See more inspirational parenting quotes when you follow me on Pinterest. That’s so true. 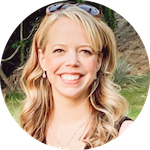 If they matter, they won’t care. One of my all-time favorite quotes!